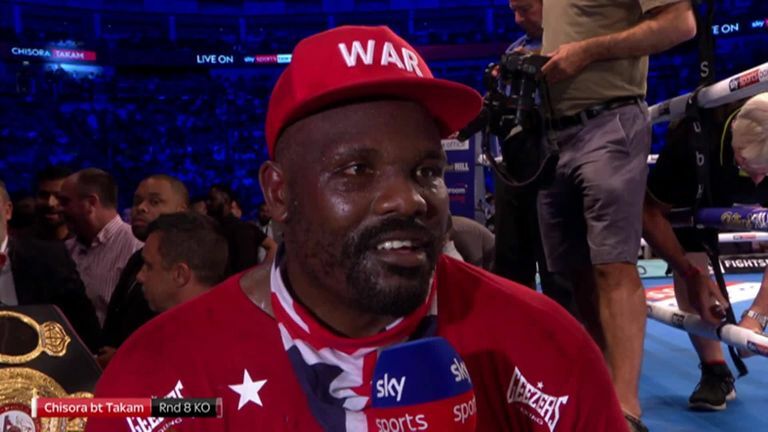 Dereck Chisora incredibly knocked out Carlos Takam in a comeback victory that took the roof off The O2. The popular heavyweight was on the verge of defeat until he uncorked two colossal right hands in the eighth round - Takam, who took Anthony Joshua into the 10th round last year, was floored twice and could not recover on the second occasion. There are two full showings, at 9am and 4pm, on Sunday, July 29. The mainstay of British boxing leapt on the ropes post-fight to soak in the feel-good atmosphere generated by a crowd who have followed his career for a decade and willed him into extending it further. Chisora was in serious danger inside the first round, which exploded into a brawl fought in his corner. Takam established himself as the bigger and stronger bully, pinning Chisora to the ropes and repeatedly hurting him with punches at close quarters. Chisora survived, enjoyed the crowd singing his name, and refused to sit down between rounds. Experienced Londoner Chisora needed every ounce of his toughness to get through the second round, built up through a gruelling career that has featured fights against Tyson Fury (twice), Vitali Klitschko, David Haye and Dillian Whyte. But Takam was hitting him too frequently. Chisora was savvy enough to stay in the fight into the middle rounds, by which time it became clear he was dangerous with single punches. The left hook, in particular, found a home in the fifth round. But Takam, who had been knocked out in the past by a hook from Alexander Povetkin, maintained a high work-rate that seemed to be wearing Chisora down. A sensational sixth round saw the fans willing Chisora, aged 34, to roll back the years - he was shipping punishment to the extent where the referee Howard Foster considered stopping the fight, but then showboated by relaxing on the ropes. Somehow, he ended the round as the aggressor. Then out of nowhere, an overhand right from Chisora clumped Takam on the top of his head in the eighth round. Takam got up but an identical punch hit him moments later and finished the fight. Chisora, clad in his trademark Union Jack across his face post-fight, earned the WBA international title and, in the context of his age and having gone 3-3 in his previous six outings, earned perhaps the result of his long career.